Students, staff and faculty can learn about community service opportunities at the Volunteer Fair Sept. 5, 11 a.m.–1 p.m. in the Student Union Atrium. Have you ever wanted to leave your mark on the world? To give back to your community or make a difference in the lives of those around you? Well, look no further. 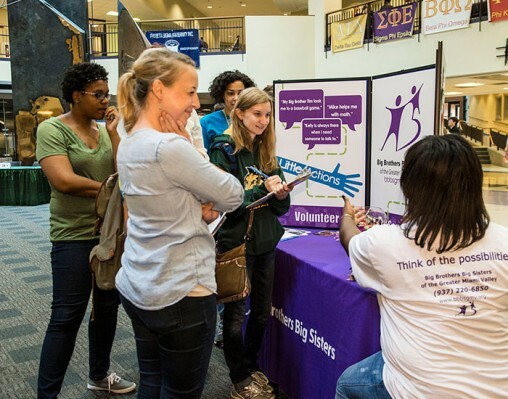 The Volunteer Fair at Wright State University on Friday, Sept. 5, will be a one-stop shop for those who want to get involved in Dayton region communities through local nonprofits. The event will take place from 11 a.m. to 1 p.m. in the Student Union Atrium. Sponsored by We Serve U — a Wright State program that provides faculty, staff and students with community service options — the fair will give attendees opportunities to make connections with more than 30 area nonprofit organizations. Representatives from the Dayton Society of Natural History, Hannah’s Treasure Chest, Habitat for Humanity of Greater Dayton, Crayons to Classrooms and dozens of other noteworthy local groups and organizations will be at the ready to answer any and all questions from attendees. 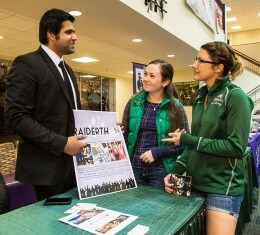 Students who need to fulfill service-learning requirements can find plenty of opportunities during the Volunteer Fair. Joanie Henricks, We Serve U co-chair, encouraged all staff, faculty, students and community members to attend the volunteer meet-and-greet. Hendricks said the Volunteer Fair also provides a great opportunity for students who must fulfill a community outreach or service-learning requirement for their program, class or scholarship. In addition to the Volunteer Fair, We Serve U is planning numerous projects for the Fall Semester. We Serve U plans to participate in Feed Ohio, a statewide initiative to fill local food pantries and feed the hungry from Sept. 2 through Sept. 13; staff the hydration station for the Air Force 5K; work with Cards 4 Kids to brighten the spirits of young patients at Dayton Children’s Hospital on Nov. 6; as well as participate in a number of other events, activities and community service opportunities.